After watching an MMFF movie last Friday, hubby and I decided to have dinner at the food court of Robinsons Galleria because he wanted me to try the Crispy Tuna Buntot from Davao Tuna Grill. He said he and his officemates keep going back to Davao Tuna Grill at SM Megamall for this. My first reaction was it was huge! It’s actually good for sharing. For only Php180.00, we already had this big tuna buntot with rice, side dish (sautéed mung bean) and soup. We just ordered an extra plate of rice for me. It was served with two dipping sauces: chilli vinegar sauce and sweet soy-vinegar sauce. We both liked the chili vinegar sauce. The tuna buntot was crispy indeed, and the meat was succulent and tasty. I actually felt like I was eating crispy pata because the Crispy Tuna Buntot didn’t taste like fish at all. My husband is not really fond of fish, but he makes an exception here. Have you tried Crispy Tuna Buntot from Davao Tuna Grill? 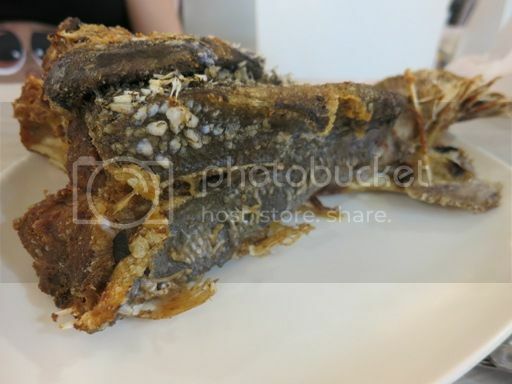 This entry was posted in Crispy Tuna Buntot, Davao Tuna Grill. Bookmark the permalink. Haven’t tried but I always see that stall in food courts. never thought it’s good.